It is not often we run into people who have a passion for that which they do. If we have a positive association with our vocations, it is usually along the lines of not minding or kind of liking what we do for a living, even though a fair number of us may actually actively dislike their work. Handywoman has an absolute passion for what she does. This is clear in every single piece of woodwork I have had the fortune of purchasing from her, and our relationship dates back to October 2014, when I bought my first weaving raddle from her. When I opened the package, the raddle was contained in a lovely quilted bag to keep it safe. 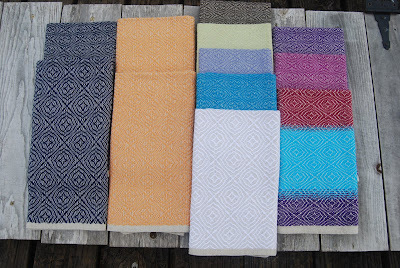 When I purchased my next raddle from her (in a different size), I told her it was not necessary to send it in another quilted bag, although lovely, because my plan was to leave it attached to the top of the loom. She replied the quilted bag cost as much as bubble wrap, but she was happy to package it in bubble wrap, if I liked. In that case, I told her, I would very much like the quilted bag, please. 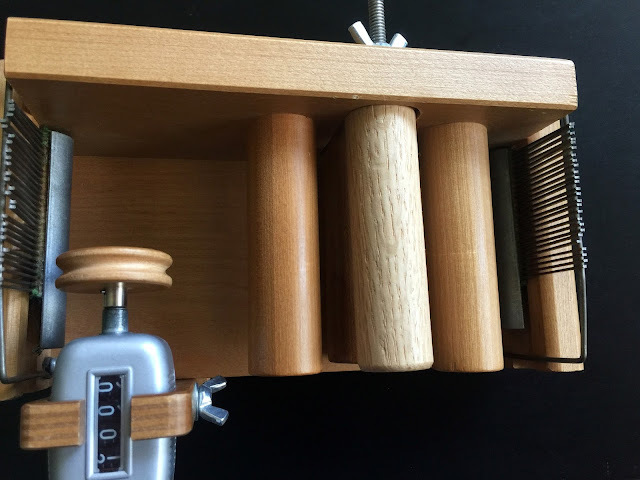 Since then, I have purchased a handmade rigid heddle loom, which holds two heddles that was made to my specifications, several shuttles (rigid heddle, double bobbin for rigid heddle and regular loom, quill, etc. ), as well as a custom cone holder (or two). 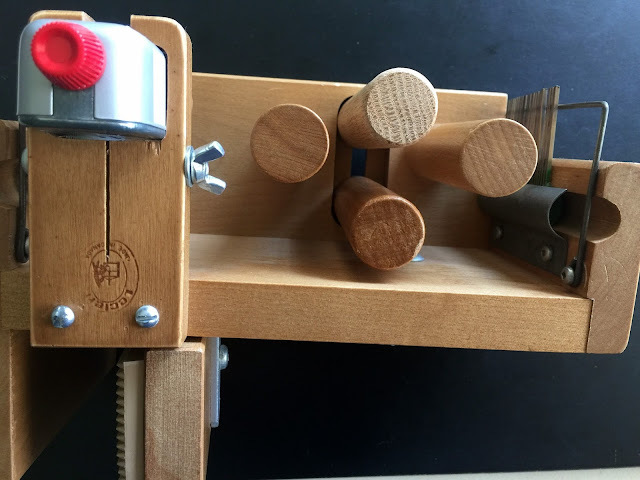 As I mentioned a week or so ago, I bought an older model Leclerc tension box, which differs primarily from the new model in the number of dowels it had. The older model had 3 dowels, and the newer model has 4 dowels. In that post I mentioned, if I contacted the right person, I might be able to buy a fourth dowel to fit my older model. Handywoman was that right person. I wrote to her and asked if she might be willing to make one for me out of a hard wood and gave her the specifications, along with photos. She asked if oak were okay (it was) and said it would be $5. "Sold!" I told her. 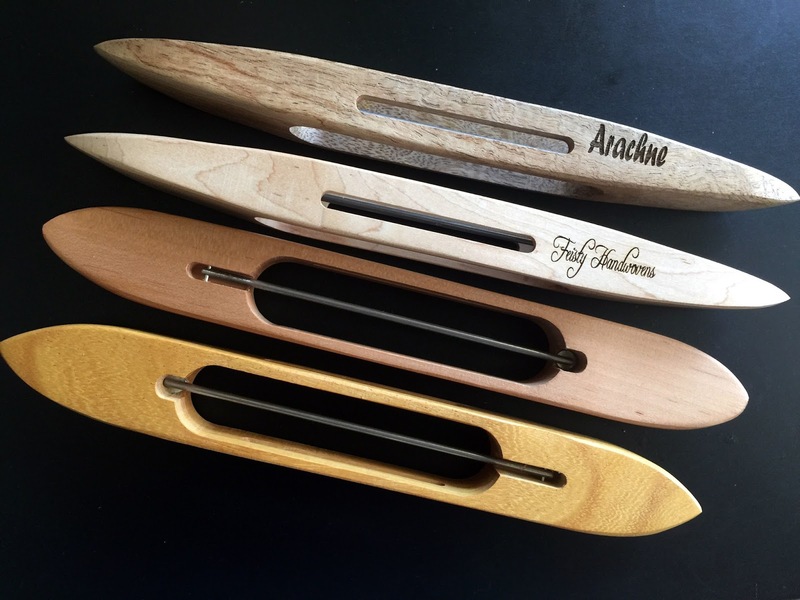 From top to bottom, they are Figured Mango, Hard Maple, Cherry, and Osage Orange. I am only keeping the hard maple with "Feisty Handwovens" engraved on it. A dear friend has named her loom Arachne. As to that tension dowel, one of these is not quite like the others, but she fits right in! 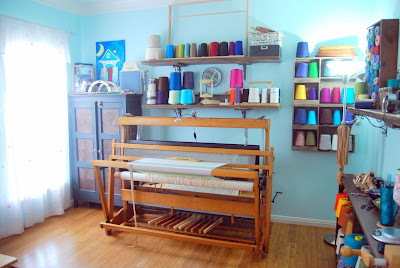 If you are in need of any kind of weaving equipment, please consider Handywoman, she is nothing short of AMAZING!